I find the holidays afford me the time to do a lot of thinking. Whether it's sitting in the bath, laying in bed at night or walking up tracks to waterfalls, I have had plenty of opportunities to think. One of the things I've been thinking about is culture. By that I mean the values/principles that drive a community. I've been thinking about the communities that I'm part of and what 'culture' I would like to see developed in them. One aspect of culture that I would love to see developed amongst Reveal is courage. 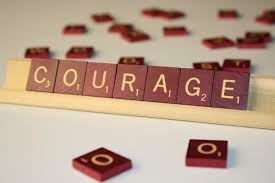 As a young(ish) leader, who is looking to develop other young leaders, it seems to me that courage is something that we need. Courage is the thing that drives us through our worries, our fears and our inadequacies to change the world. God calls us to be courageous. There was a man called Joshua in the bible. He was a pretty cool dude and did some amazing things for God's nation of Israel. He led the people of Israel across the River Jordan into the land that God had promised their ancestors and there triumped over innumerable hardships, problems and enemies to see God's Kingdom on earth established. But Joshua wasn't a man without fear. He was so scared that when God called him to lead he had to be reminded 3 times by God to be "strong and courageous." Joshua felt fear, but trusted God's promises and overcame it. He showed courage in overwhelming circumstances and we are called to do the same. In the Wizard of Oz, the absence of a heart meant that the lion had no courage. We link the two together; hearts and courage. So, when Jesus is about to face the cross and knows that soon after that he will be resurrected and ascend to heaven, he talks to another group of young leaders. He tells them that it will be tough, but reminds them to "Take heart! I have overcome the world!" (John 16:33). He tells them to be courageous. Yes, it will be scary. Yes, you will be persecuted. Yes, I will be going. But take heart. Know that I have overcome the world and therefore you have nothing to fear. Know that I will be with you to the very end of the age. He says the same to us. Being a christian is not an easy task in a secular world, but we're called to be courageous in sharing our faith and courageous in living out our faith. Just like the disciples. Timothy was another young leader who felt fear. He was already a young pastor, already a leader in many people's eyes, but he too had to be reminded to be courageous. To trust God in his life. Paul had to remind him that "the Spirit God gave us does not make us timid, but gives us power, love and self-discipline. So do not be ashamed of the testimony about our Lord." (2 Tim 1:7) Timothy had to be reminded that in him dwelt the Holy Spirit, who equipped him for every situation he faced. He had to be reminded to be courageous and to not be ashamed of the gospel. That is a reminder to us too. When he remembered this, Timothy did great things and faced down mighty challenges. We can too! 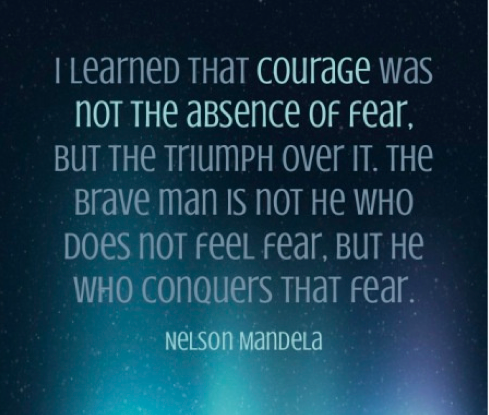 Nelson Mandela once said "courage was not the absence of fear, but the triumph over it." The great thing about being a Christian is we are not alone. We don't face fear by ourselves. We have a God who has already overcome the world covering our backs. We can take courage in him. Wouldn't it be cool if like Joshua, the disciples and Timothy we were known for our courage? If we were courageous in sharing our faith; courageous in standing up for what's right; courageous in sharing about our struggles; courageous in our friendships; courageous in offering prayer; courageous in sharing a picture or word at the front of church. When was the last time you trusted God and did something courageous? How about trying something today?